This weekend has featured the first good weather we've seen in weeks. 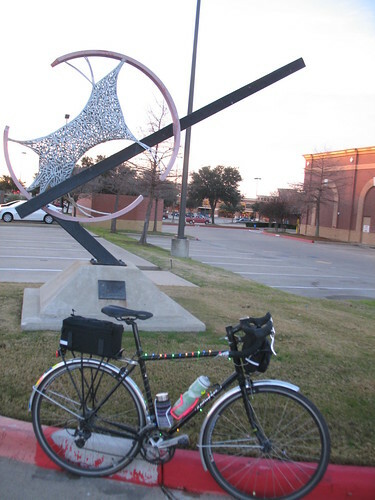 It's also two weekends before the next Houston brevets, so it seemed like a good time to get in a long ride. I decided to go for a century ride, in honor of the "traditional"* MLK Day century ride put on by the local racers. They are riding today, but I decided last Wednesday that Sunday would work better overall. The racers hadn't declared their plans to actually do the MLK ride until Friday, and I don't necessarily enjoy riding with a bunch of guys who are hotdoggin' it when I know my fitness levels aren't great. The last time I rode any distance of any significance was in mid-July of last year, when scrottie, J and I did an Overnight 300k Of Some Strife, so it seemed like a good idea to plan the present ride with plenty of bailout points. I started by riding down to meet up with a loose aggregation of regular weekend riders who gather outside of a Prosperity Bank, and are thus known as the Bankers' Ride. They are non-hotdoggers who enjoy a good ride at a pleasant pace. After some nice loops through peaceful countryside, I bid them farewell and carried on. There isn't too much to say about the rest of the ride - I crossed a few small streams and saw two herds of deer, three hawks, a coyote, cows, ponies (! ), horses, and goats. I finally ate some of the country-store pizza that's always advertised but rarely actually available meat-free. My energy levels were good up until mile 92, but by that point I was back to riding on familiar roads anyway and knew I could finish things out. I think I'll aim for closer to 50 miles next weekend, perhaps with the bankers again. Since they depart at 7:30 am sharp, it should be possible to get in a morning ride that doesn't consume the entire morning or day. Sometimes it's nice to ride with company. Sometimes it's really nice to ride alone, and only have to tune in to my own thoughts. *In case you were unaware, anytime you do anything more than once in Aggieland, it becomes a tradition. The particular ride in question does have a longer history.